Looking for the best IR universal remote apps for Android but don’t know which one you should go for? With an IR universal remote app, you can control everything from controlling your TV to your projector. The possibilities are endless, and your Android phone’s IR transmitter can do the job for you. However, not all IR remote apps are good, and you might want to save time choosing the right one for you. Why pay when you can get it for free? Here are nine of the coolest apps for you to try out. SURE Universal has provided software that can help you embrace IoT which can be fully integrated into your home. 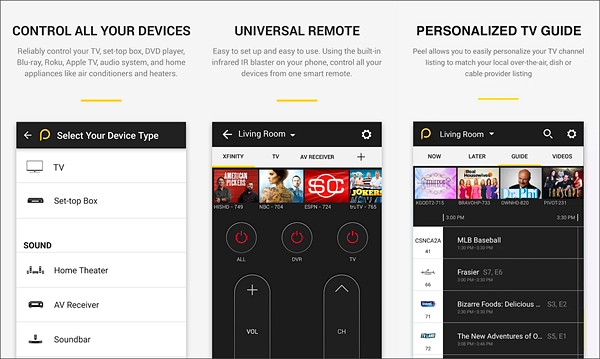 You can download the universal remote control app on your Android device. It gives you the power to control any appliance in your home. The SURE Universal remote can support any protocol in common use due to the combination with the standard OCF. Therefore it can connect with various smart home technologies such as RF like Z-wave and ZigBee. Moreover, it can also connect on network technologies such as Bluetooth and WiFi. The best thing about this Android remote control app is that it allows you to send all your photos from your Android device to the TV. You can move the photos manually and even create a presentation. All this power is in your hand, and you can integrate Amazon Alexa Voice to do all these. SURE Universal lets you control more than a million electronic appliances. However, you need an Android device with an infrared blaster. But for phones with no IR such as Samsung Galaxy S7, S8, S9 and Note 5 you can use a Broadlink WiFi-IR blaster. Change the colors, positions, texts, and icons. Execute commands with a single touch. Integrate voice commands using Google Now. 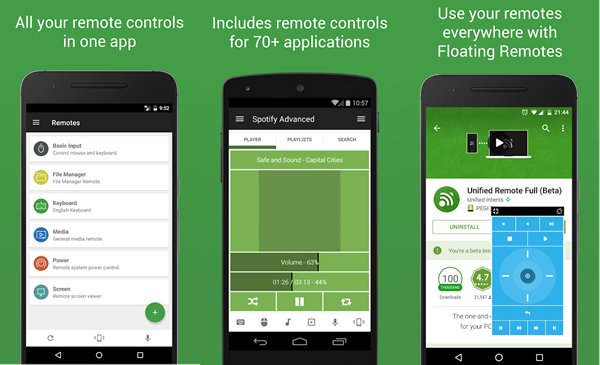 Float remotes while you are using other apps. Touch gestures for eyes-free control. Remote control for a TV. However, the Smart IR Remote only works for devices which have an IR-enabled phone. But if your device can work over WiFi, then you can use the universal remote. There are two varieties of Google Home. There is the one which is the Oracle that lets you know your programme for the day. And if you so desire, you can fill your room with whale noises. On the other hand, there is another type of Google Home which is more than your answer box. 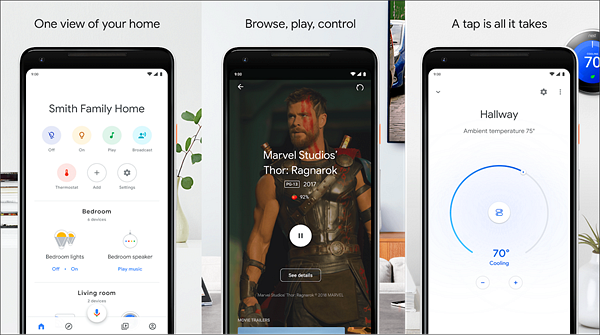 It is an app which sets up, manages and controls your Google Home, Chromecast devices and customizes what you will get from the Google Assistant. Here is a rundown of the key features which Google Home app handles. One touch gives you the control of your home. Thus you can control your Google Home and Chrome cast devices plus connected devices such as the TV and the lights. Control all the devices in your home with just one touch. The Discover tab gives you the chance to discover new features and updates on your compatible devices. For instance, you can find new content from popular streaming sites such as Netflix and YouTube. Unified Remote is the device which you need if you are an individual who uses the desk computer a lot. You can control your PC from your smartphone as long as they are connected to the same WiFi network. However, you will need to install the mobile app on your smartphone and the desktop application on your PC where a quick scan from your mobile app will be able to give you the control you need. Turning your phone screen to a touchpad that works like a mouse on your PC. It mirrors your PC screen on your mobile device. Powers your PC using WOL. The keyboard can support all types of keyboards such as standard, 3rd party and customized. 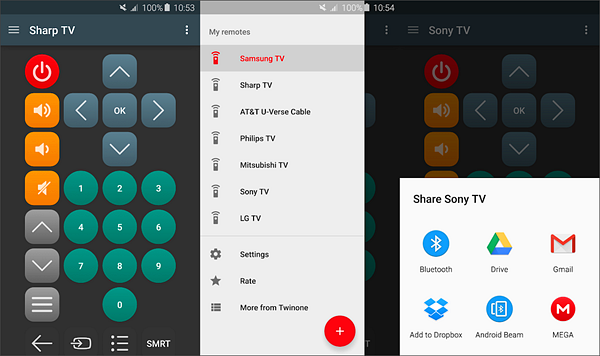 Twinone is a free universal TV remote app. It has a friendly interface for your smartphone. The app is easy to use. All you need is to open it and choose the device you want to control either your TV, cable box, satellite or any other appliance. However, for the devices which don’t fit the categories, there is support for some of them. However the remote only works with mobile devices with IR blasters. The app has a couple of built-in codes that might be useful. The bad part is the advertising. Twinone is not providing an effective way to get rid of them. A paid feature can really come in handy to accommodate the ads. 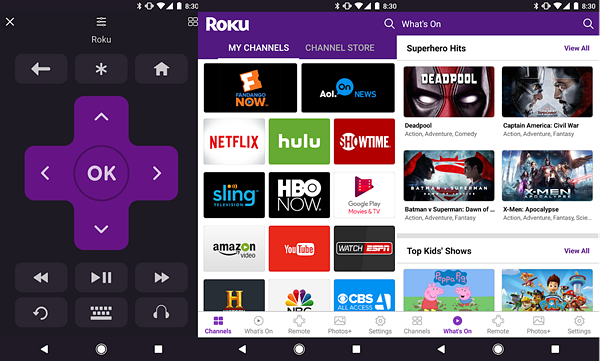 If you are a Roku owner, then the Roku app is an excellent universal remote control app for you. It is a free application which you can download either on the Google Play Store or the Apple Store. The mobile app becomes your companion either on Roku TV or for Roku streaming players. The Roku app requires you to connect to the same network as your Roku platform. However, there are some features which might require you to log into your Roku account, so this should not worry you. The remote control app lets you control pretty much anything on Roku. The remote comes with fast forward, rewind, play, play, navigation and voice search buttons. The only thing it does not have are the volume buttons thus you will need your actual TV remote. Search for all your streaming channels at once. Instant replay to hear that dialogue again. Cast devices from streaming sites to your TV. Yatse remote is the most popular XBMC/Kodi app. It can be downloaded for free on Android, iOS and Amazon app store. 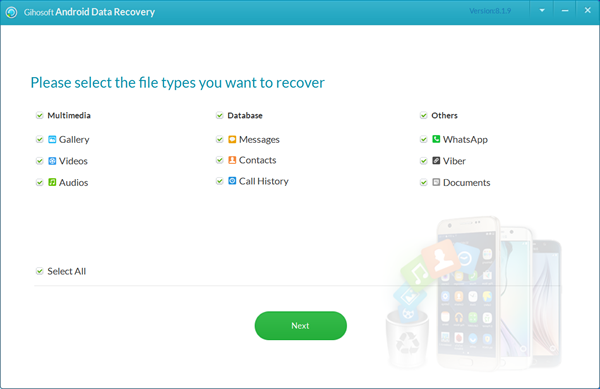 Once you install it on your phone, it easily configures with your device. Yates’s widgets come in different sizes and can give you various functions. They will range from notifications to all the remote capabilities. Yatse offers natural voice commands in seven different languages. Yatse synchronizes your media library over different installations. You can access your library offline. 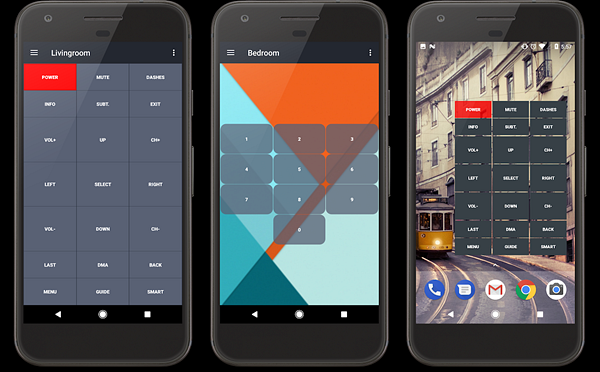 Themes that you can use to skin your Yatse app. The IR Universal TV Remote is the perfect remote you have been looking for your physical TV. For instance, if you are watching a TV with an antenna, it will point the best direction for your DTV antenna. 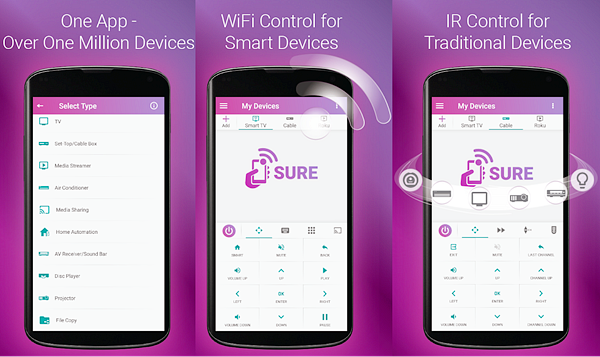 The IR universal remote control app does not only control your physical TV but also the Air Conditioner, Fans and Lights. However, for the application to function, it will need a smartphone device which has an IR blaster. You can customize the remote. You can edit almost every aspect of the remote depending on your preference. You can easily use the two widgets to control devices from your home screen. Set up macros so that you can control multiple devices with a single touch. The IR Universal Smart Hub will allow you to control multiple devices from different rooms. Moreover, you can also read infrared codes from other remotes. Peel Universal Remote app was one of the most popular apps when devices used to have infrared for like two minutes. Once it collaborated with devices such as Samsung, it gained more than 70 million downloads. 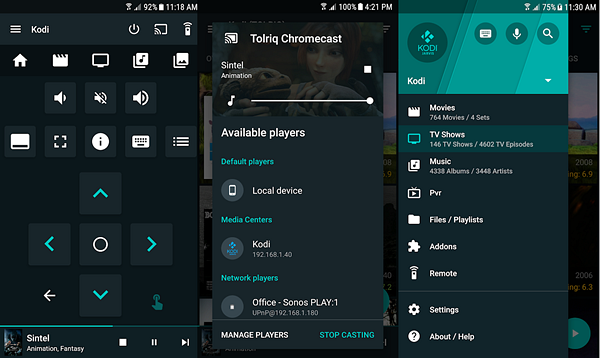 The Android remote control app lets you turn your smartphone into a remote where you can control appliances such as the TV, Air Conditioner, Set up boxes and devices like Roku. However, the app only works with smartphones which use an inbuilt IR-blaster. 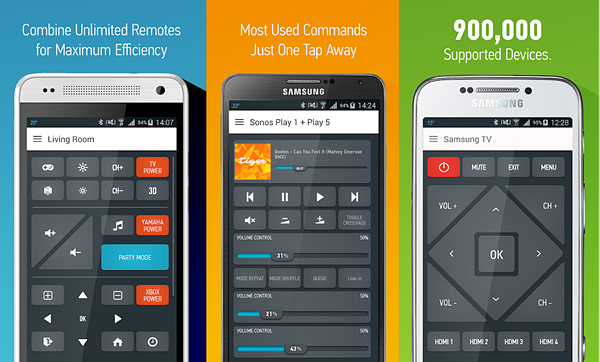 If you are looking for the best free universal remote apps for Android, try these out today. We are sure you won’t be disappointed.